We love lists at TBP. The 25th anniversary of the CD is a convenient excuse for these fascinating yet irrelevant data points about the development of CD technology. • The compact disc project was launched following Philips’ failure with its video disc technology in 1978. • The video disc was one of the first commercial products to take advantage of laser technology that could read information from a disc without any physical contact. • Research into the video disc began as far back as 1969, and itself was inspired by Italian Antonio Rubbiani, who had demonstrated a rudimentary video disc system 12 years earlier. • In 1970 Philips began work on what was called the ALP (audio long play) – an audio disc system to rival vinyl records, but using laser technology. • Lou Ottens, technical director of the audio division at Philips, was the first to suggest that the ALP be made smaller than the dominant vinyl format and should aim for one hour of music. • The project initially flirted with the idea of quadraphonic sound but a disc with one hour of music had to be 20cm in diameter and so the plan was abandoned. • In 1977 Philips began to take the development of a new audio format much more seriously. A new name for the product was discussed and names considered included Mini Rack, MiniDisc, and Compact Rack. • The team settled on Compact Disc because it was felt it would remind people of the success of the Compact Cassette. • In March 1979 Philips conducted a press conference to show off the audio quality of its CD system in production and also to impress upon rivals how well it was progressing. • A week later Philips travelled to Japan after the Japanese Ministry of Industry and Technology (MITI) had decided to convene a conference to discuss how the industry could create a standard for the audio disc. The company left Japan having agreed a deal with Sony. • Philips’ plan for a CD with a 11.5cm diameter had to be changed when Sony insisted that a disc must hold all of Beethoven’s 9th Symphony. • The longest recording of the symphony in record label Polygram’s archive was 74 minutes and so the CD size was increased to 12cm diameter to accommodate the extra data. • In 1980 Philips and Sony produced their Red Book, which laid down all the standards for compact discs. From that time on the companies worked separately on their own CD equipment but in the early days agreed to share components. 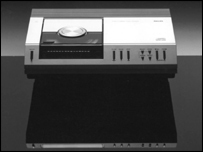 • In April 1982 Philips showed off a production CD player for the first time. "From now on, the conventional record player is obsolete," said Lou Ottens. • The first commercial CDs pressed were The Visitors by Abba and a recording of Herbert von Karajan conducting the Alpine Symphony by Richard Strauss. • US record labels were initially very sceptical about the CD. A year after launch there were 1,000 different titles available. • In 1985 Dire Straits’ Brothers In Arms became the first CD to sell more than one million copies. It is still the world’s most successful CD album. • In 2000 global sales of CD albums peaked at 2.455 billion. In 2006 that figure was down to 1.755 billion. CDs had a good run. Any guesses on how long until we see an Ipod with a wireless internet connection allowing use with Sirius internet streaming or maybe an Apple clone of Sirius sans satellites? It’d be nice if a radio station could mix my purchased songs in with random stuff it thinks I might like. I’ve read some technical literature about the CD standard – 25 years later, the amazing techniques employed in the CD standard are still the benchmark for modern storage technology – Solomon-Reed interleaving, run-limited-length channel encoding, PLL-based clock recovery from the data. Amazing how little have changed since the 80’s theory-wize. …The CD and hocus pocus corporate pro-forma EBITDA accountancy are the same age. from what I’ve read the reason a CD is 74 minutes was that is was basically a mandate from the CEO at the time that his favorite piece of music, Beethovens 9th, had to fit on the disk….not that someone thought it was a good idea mind you…..it came from the top . Wasn’t Beethovens 9th also the most popular piece of classical music in Japan and Sony was insistant that it fit one disk too? I do remember reading a piece about it and it was in interview style and the question came up as to why it was 74 minutes. CEO, at the time, told the story I related above. He may be FOS but that’s what he said…sounded plausible….I have a good understanding of japanese culture and realize how that would work in a company like Sony…. Wow, is Brothers in Arms really the best selling CD album? I still remember sitting on the floor of a friend’s house listening to that album as our dads tried out their new toy, the Compact Disc player. Dont forget the first rock artist to record an album in all digital DDD format – the great Frank Zappa.